Q1: Do you do custom heads? A: No, But I accept suggestions. You can send real faces images in a notecard to Catwa.Clip inworld. Q2: Will the Frames animated heads be upgraded to Bento? A: No, Their vertices can not work smoothly with the new bones, also their animations can never look the same with bones. Q3: What is the difference between frames animated heads and bento heads? A: Frames animated heads are rigged to 2 bones [Neck, & head bones] and they are animated by using meshes to create frames. Bento heads are rigged to 42 bones [for all facial parts], that rig will allow you to use shapes sliders to change the facial features and will allow me to animate using those bones instead of frames of multiple meshes. Q4: Can you share with us the shape sliders values for a none bento head so we can apply them on a bento head? A: You can not! As much as you could not make a system head look like another mesh head. Heads are created by sculpting manually in 3D programs means no shape sliders were used. Q5: How to fix makeup layers turning to white specially when underwater? A: Toggle the Mask/Blend button for that layer to force it to blend using the master or main HUD. If its the Bento Head, make sure you do that for the upper and lower layers by checking upper then force it to blend then checking the lower and force it to blend. 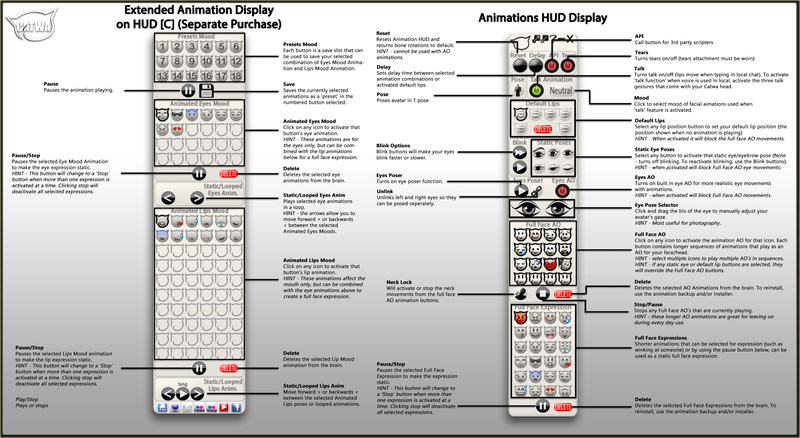 Also make sure you have checked hardware skinning in the graphics settings. Q6: What is the difference between Basic and Premium Head? A: It’s mainly about Basic Head being more affordable than premium heads. Both have same Pricing. Both come in High Quality meshes. Basic Heads comes in many add-ons so you can purchase only the option that you need. Premium heads comes complete you don’t have to purchase it in parts [Add-Ons]. Also Premium heads have a huge optional add-on animations pack that basic heads don’t have. Q7: Premium Heads have only 3 default lips, when Basic heads have 6 of them! A: Yes that’s why when you purchase the equivalent add-ons of the Basic heads, it will cost slightly little more than the premium heads Because it has few more default lips. 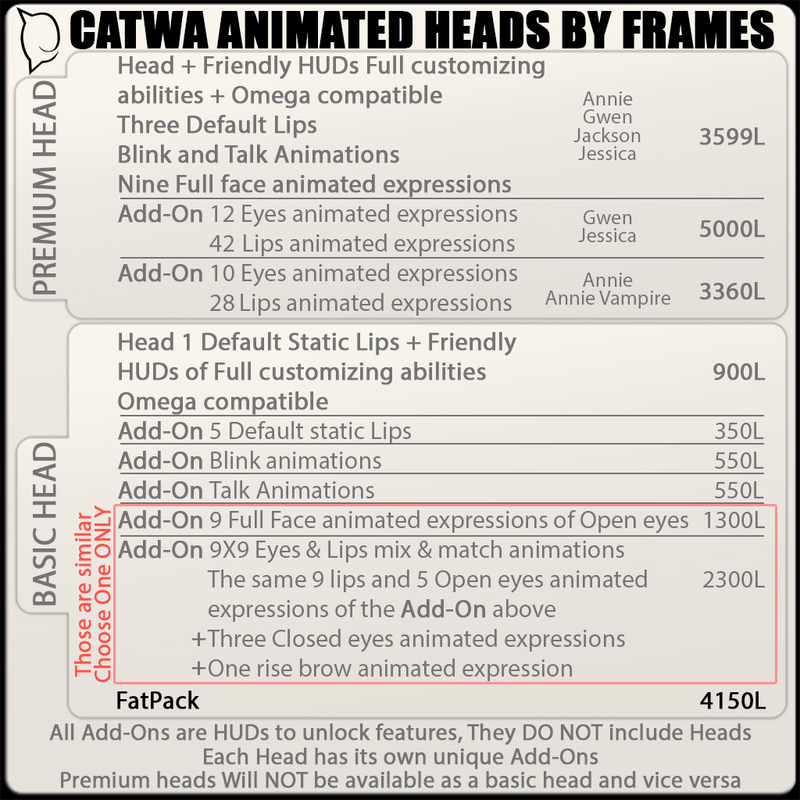 Jessica and Gwen heads have 3 animated ones in the add on upgrade activator pack. Q8: My blush applier replaces my freckles applier, My beard applier replaces my tattoo applier, how may I apply 2 appliers on one spot? A1: If you have a none bento head, you only have one makeup layer on the whole head except the ears. There is no way of adding more than one applier for each makeup layer. Except for male none bento heads, they have 2 hairbase layers, to be able to wear beard and hairbase on the hairbase layer. A2: If you have a Bento Head, you have 2 of each makeup layer, 2 brows layers, 2 blush layers and so on… all appliers will always go on your lower layers. If you want to switch one of them. You use master HUD. Check lower click save on any save slots of that makeup section, then check upper layer, then apply what you have saved. I did this in my Bento video and Mochi explained it more on her lipstick video as well. Q9: The back of the male’s head when using the Niramyth neck-size is not fitting perfectly even tho I am wearing the Headblender that came with the Niramyth packs, why? Why adding a Niramyth size if the fit was not perfect? Hairbase is not working with this neck-size why? A: I already wrote WARNING in the item’s description and posted Videos [Video1 Video2 Video3] that the Niramyth neck fitting is not 100% perfect and that is because the Niramyth was not designed to fit our default SL avatars. The reason I added Niramyth neck size is because many costumers asked me to do so, since all of those guys willing to wear mesh hair to hide the back of the neck which is not looking so perfectly being bald. No solution for under the chin tho. I wrote about the hairbase layer 1 was not designed for Niramyth you need to clear hairbase layers 1, or use layer 2. Q10: I misread the head’s name and purchased the wrong one. Can you send the correct one? A: I’m so sorry if it is not a double purchase, I can not refund or exchange. Purchases are final, can not delete a purchase history, even if you proved you deleted it from inventory, I can not remove records from my redelivery terminals. Q11: How do I know I am getting the correct Add-On for the head that I have purchased? A: At inworld store each head has its own add-ons beside it. You may read the Add-on’s vendor name, or the Head’s name on the ad picture beside the vendor, it should match the Add-On’s name, or the item’s description at the marketplace listings or also the item’s name at marketplace. Or you may always ask me before purchasing if it’s too confusing for you. Q12: Oh no I purchased the wrong Add-On, can you send me the correct one? A: I honestly did my best to put a very clear item’s description. Purchases are final can not refund, can not delete a purchase history, even if you proved you deleted it from inventory, I can not remove records from my redelivery terminals. Q13: Can I at least get a discounted head since i purchased the wrong activator? A: If I want to give more discounts I would give to all of my costumers not only one, that wouldn’t be fair. I am already giving free stuff at my main store on the reception desk. and Credits when purchasing from inworld store. Q14: But why not one add-on for all heads? A: Because each head has its own mesh, many people think the heads move by scripts only, something like copy and paste. That’s not true! its like a pants and skirt meshes not the same in everything. each Add-on to be created needs lots of time and effort. Q15: Since you don’t refund me and don’t exchange. I will write a bad review so others can be careful since I’m a reviewing engineer I know what to say. A: I already warned everybody and I am not responsible for purchases made without reading. Buyers will read the item’s info before reading your review anyways. Q16: I like one of the expression from the head called XXXX to be available for the head called YYYY, is that possible? Q17: My head disappear after teleporting, what should I do? A: Make sure you have [Female Head V4.10] or [Male Head V4.11], you can get the latest version for you head from redelivery terminals at Main Store. Q18: The upper part of my head disappears/Flash while blinking? A: That can happen in laggy sims or when having slow connection. Use the slowest blink speed in that case, Make sure you have [Female Head V4.10] or [Male Head V4.11]. Q19: I purchased a gift using marketplace but I did a mistake and the gift was sent to me, can you send free same item for my friend? A: If the item gifted was already purchased for yourself before you try to gift it, that means a double purchase, in this case I can refund. If the gifted item was the first time purchased for yourself, in that case I can not do anything I can not send a free item for your friend I can not delete the purchase. I already removed gift option from my inworld vendors to avoid such a mistake. But I can never control marketplace. Linden Labs are the team who run the Marketplace website. Please submit a support case for Linden Labs for any kind of marketplace issues because I have no power on marketplace website at all. from the drop down type of problem list choose marketplace. Q20: I want to know more about CATWA Store Credits? A: CATWA Store Credits Info. Q21: When do you refund? What does double purchase mean? A: We refund only when double purchase. Double purchase means buying the same item more than once for the same person. 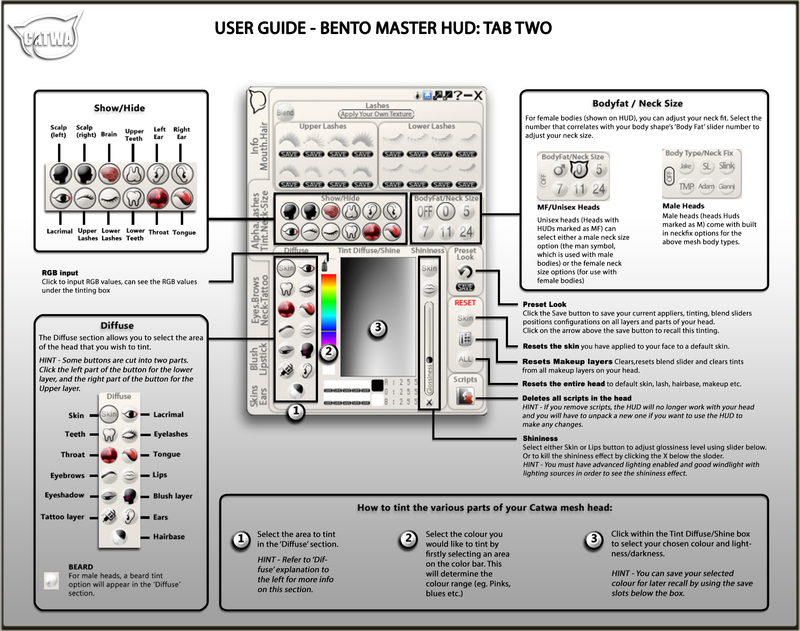 Q22: The Bento HUDs looking complicated, do you have manuals? A: We have many videos on CATWA youtube channel and many other bloggers channels as well, along with user manual guide images For Animations HUD and HUD C, for Master HUD Tabs1,3,4,5 and Tab2.